Keyword implementation is a crucial component of search engine optimization, as it helps your business ensure you are getting your website in front of your potential client audience. 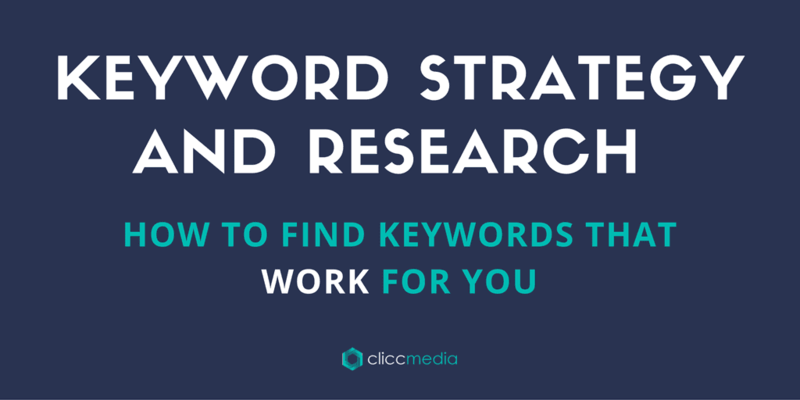 Finding and utilizing these keywords will take a bit of research, but it is worth it! Once you find the perfect set of keywords with a high potential for reaching your target audience, you will be successfully driving traffic to your website that will likely result in conversions. Learning what terms your target customers search for when looking for products and services similar to yours is a great way to begin your search for quality keywords. It can be as easy as asking your existing clients, “how did you find us?”. If you find they respond with Google or a similar search engine, you could follow up with asking what terms they typed to find you. More than often, using their keyword phrases in your title tag or meta description can help drive additional traffic to your website. Another option is brainstorming with your sales team and asking them questions like, “What are common terms or phrases you hear when communicating with existing customers?” or “What are some words or phrases you see clients use when referring to our products?” Going back and forth with questions like these can help you get a better understanding of where to begin. Alongside getting suggestions and insight from these channels, you should also consider looking at your primary competition. What keywords are their client’s using to find their product? Check their title tags to see what phrases they are inputting. Look through their meta descriptions and throughout headlines to see how they are wording their services or products to reach their target audience. If you are selling similar things, it’s possible these keywords can help steer you in the right direction and give you some ideas. At the end of your brainstorming session, you should have accumulated at least 10 up to 100 terms. As you do additional research, you’ll polish this list down to a smaller number of strong, working keywords. Once you have compiled a list of potential keywords, you will need to narrow them down to those that will actually provide the results you want. 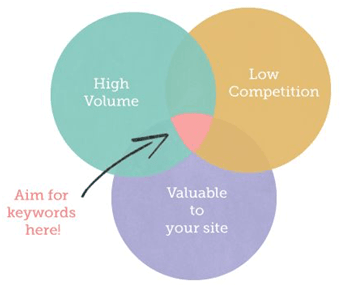 To reiterate: the perfect keywords are low competition, high volume, and are relevant to your site. To assist you with discovering which terms fit into this category and which do not, you may have to turn to some external resources, such as Google Keyword Planner within Google AdWords, Word Tracker, or Keyword Tool. These SEO tools can help you better understand the type of results you can expect from your keywords. Use a combination of resources such as those mentioned above and others such as Google Analytics and Google Suggest. You may also consider bringing in a professional team, such as Clicc Media Inc to help you determine the best search terms to boost your online marketing campaign and overall web presence. A great tip to help keep organized is to put together a spreadsheet that lists all of your brainstormed keywords; along with columns that show the number of monthly searches, authority, competition level and even cost (for PPC purposes), this can help you eliminate words that will not work for your campaign. What Type of Keywords Should I Aim For? There are a few different types of keywords that exist, including long-tail, medium-tail, and your “fathead” or one liner. Medium-tail keywords bring you a high number of people searching for these keywords but only a portion of them are looking for your services. Long-tail keywords are much more specific and therefore will have a smaller amount of people searching them, but it is more likely that when searched, you will be matched with someone who is looking for your exact product or service. One-liners are single word terms, such as “sweater” that are searched for by a very high volume of users and can produce millions and millions of results. I’ve Got My Keywords, Now What? Now that you’ve got a comprehensive list of working keywords that will provide ideal results for you, it is time to put them to use. This means creating quality content that incorporates these keywords into important areas so they can be indexed and found by potential clients. After all, that’s the ultimate goal, right? Develop headlines, phrases, and texts that use these keywords strategically. Are you addressing clients on a local or national basis? Focus your campaign on the exact audience you’re looking for. For example, a great way to do this is to include the city you are targeting into your keyword phrase. Additionally, you’ll want to have a list of multiple interchangeable keywords that will satisfy your SEO factors. This way you can choose from terms that are specific to each area of your service or company that you wish to bring traffic to so that you can alternate between them. Creating content can be done by publishing blogs or articles on your website, posting updates and tweets on your social media sites, creating videos or skits to share to your users, and much more. Not Seeing The Results You Desire? Clicc Media Inc is dedicated to providing clients with clicks, conversions, and customers. We can help you steer you in the right direction with SEO tactics and web marketing solutions to help your website be the best it can be. For more information or to schedule a consultation with our experts, please call us at 954-271-3111.